For the first time since 2007 the Browns have a 7-3 record 10 games into the season and bizarrely are in last place in the division with six games left to play. If the season were to end today the Browns would be frozen out of the playoffs and an Atlanta that the Browns beat at the weekend would not only be playing in the playoffs but also have home field advantage. I know the Browns need to earn their spot in the playoff but to miss out while a team that has 4 wins after eleven games gets in is just plain ridiculous. The Browns are still trending up and I don’t see why it will stop. One of the main reasons I fell the Browns will continue to succeed is Josh Gordon. The man is an absolute nightmare for opponents as must be accounted for at all times. Based on what he showed Sunday against the Falcons and what we saw last year I think that if he had 500 receiving yards in the six games he was eligible for, it would be a disappointment. Its not just the threat of him on his own though, its what he does for others. With all the attention he attracts on the outside with almost always having a corner and safety on him it opens plenty of opportunities for players like Andrew Hawkins and Miles Austin in one on one situations. It also means that the eight men in the box that the Browns say regularly early in the year are gone which leaves an abundance of running room for Isaiah Crowell and Terrance West on the ground. That’s before you even consider the impact that Jordan Cameron will have when he comes back. I know people will bring up the fact that Brian Hoyer threw 3INTs against the Falcon but when it came down to that final drive he was clutch. Hoyer and Josh Gordon’s timing was clearly off but that was to be expected in their first game since week 5 of last year. Leading the Browns down to 19 yard line in 39 seconds Hoyer showed how quickly he can put a bad throw behind him and move on. It wasn’t Hoyer’s finest hour but he got the job done with a little bit of help from Mike Smith and his bad clock management. Hoyer also accepted full resoponsiblty after the game for the poor performance saying “Its nice to get a win and be 7-4 but I’ve got to play better… I’ll be dissapointed in my performance for the whole week”. The only thing standing in the Browns way down the stretch is injuries and there’s quite a number of them. 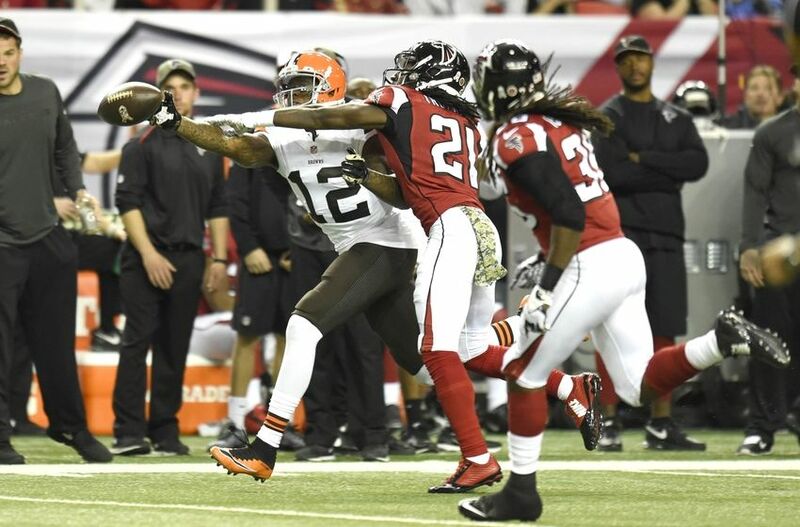 FS Tashaun Gipson was having a Pro bowl worthy season this year and led the league in interceptions with 6 but was injured in a collision with team mate Joe Haden against the Falcons and picked up a MCL injury meaning he probably wont play again this year unless the Browns make it to the playoffs. Gipson is a big loss in coverage as well as he was only allowing a QB rating of 41 when in coverage. MLB and locker room leader Karlos Dansby picked a knee injury two weeks ago against the Texans and missed last week nut is said to be Questionable for this week against Buffalo. OLB Jabaal Sheard was also injured against the Texans and was initially thought to be out for the season but subsequent tests showed it wasn’t as serious as first thought and may be back later in the year. That’s before you mention the leg break All-Pro center Alex Mack picked up in September which has out until next year. Looking at Browns schedule for the last five games they really control their destiny in division with the exception of Pittsburgh who they would have the tiebreaker over if the finish with the same record. A home game against a Bengals, team they completely dominated in their last match up on Thursday Night Football and a game away to the Ravens are going to be crucial in how the division shapes up. The Browns play a Bills team this week whose playoff hopes are all but gone bar a collapse from the six teams ahead of them in the wild card race and a win over them would be doubly valuable as well as the Browns have their pick in Draft from the Sammy Watkins trade and the more valuable it is the better. The Browns other two games vs Indianapolis and @Carolina aren’t as significant as the others but hold a personal importance to myself as both these teams are supported by friends and win against them and bragging rights would be quite sweet. The Browns don’t have the easiest schedule left but its not the most difficult either. San Diego still has to play Baltimore, New England, San Francisco, Kansas City and Denver. All these teams have at least 7 wins from a possible 11. The San Diego-Baltimore could be particularly important as whoever loses is probably not going to have enough time to make up the ground they lost. Of all the teams left in wild card race I think the team most likely to make it is the Chiefs and the one least likely that still in the picture would be the Dolphins as even though I like Ryan Tannehill and that team I think its a year too early for them. I not expecting the Browns to go out and win out but I don’t think them winning 3 out of their last 5 games would be unreasonable. For the first time in more than a decade the Browns could be heading to playoffs if all things go right. November is often said to be the most important month of college football as November is when all of the non conference games are gone and the division races are heating up and this year is better than usual as instead of the 4 we usually we have there is 5. The number of notable things so far in the month; we saw Mississippi State lose for the first time, my beloved Buckeyes beat two ranked teams in Michigan State and Minnesota, Notre Dame capitulating horrifically and getting a good idea of who is in the play-off picture. First of the Buckeyes beat reigning B1G 10 champs Michigan State 49-37 in East Lansing to pretty much wrap up the East division and also gave the Buckeyes a signature win of a top ten programme. JT Barrett continued to look impressive since the loss to Virginia Tech and will probably get an invite to go New York as a Heismann finalist this year. The Buckeyes are in sixth at the moment looking in on the rest and really probably needing a loss to get into the play-off although I don’t see Miss State finishing in the top 4 unless Alabama loses again which could happen quite easily against Auburn in the Iron Bowl or in Atlanta in the SEC championship game. The Buckeyes still will probably play a top 15 ranked team in Wisconsin in the B1G Ten title game and it may enough to push it in but its gonna be tough but if the y didn’t make it I couldn’t really have any complaints after they lost to Virginia Tech. What’s gonna happen with the QBs next year? I know Braxton Miller will be the fifth year senior coming back from injury but can you really take the job away from JT Barrett after the way he has come in and absolutely dominated since the Virginia Tech game? JT Barrett performed so well that he beat the record for Touchdowns in a season set only last year by Miller. I think its gonna be a hell of a battle in camp and will probably result in time be split between the two in the early non conference games but eventually Urban Meyer is gonna have to make a decision one way or another. Regarding the whole Oregon being ahead of Florida State in the CFP poll its ridiculous. FSU isn’t popular with the public and hasn’t been too impressive in the way it beats people (see Miami and Louisville games) but still undefeated and that trumps all in my books. The Seminoles should be first until the show the aren’t deserving of it. I know people will say it doesn’t make a difference once there in but seeding does matter with opposition and its a lot easier for the Noles to play close to home in the Sugar Bowl, than it is too cross the country and go the Rose Bowl. That boy Melvin Gordon sure can run can’t he? 408 yards in three quarters is pretty sweet for the guy supposed the second best back in this game. Gordon’s record breaking performance helped power the Badgers to 70-29 win over Nebraska which has probably helped to decide the division in Wisconsin’s favour. My favourite statistic was the one that on 7 of Gordon’s run he wasn’t touch until he was 20 yards or more down the pitch. I watched this game and I have never I mean never seen tackling as bad as it in my life. At one stage he ran through three Corn huskers and the most any of them could offer was a half-hearted arm tackle. I thought watching the game that if he stayed in for the fourth he could have broken 600 yards and that’s not exaggerating as the entire game after the first quarter seemed to be Nebraska three and out (1 of 10 on 3rd down) and Melvin Gordon big run, Melvin Gordon big run, Touchdown. 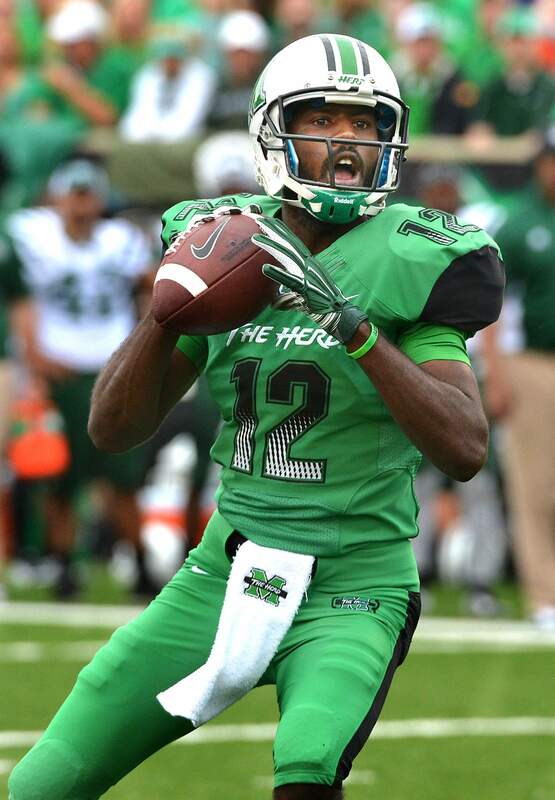 I just hope he is not this good against Ohio State. Todd Gurley has been one of my favourite players right from the very start as only the second college game I ever watch was the Dawgs lose to Clemson last year to start off the season and he just blew me away. A devastating combination of power and pace Gurley was star for Georgia and its really disappointing for it to likely end the way it did. A really hope he makes a full recovery from this injury and be star at the next level because I think he will be but you never know with knee injuries, just look at Marcus Lattimore. Lattimore, an All American at South Carolina tore his ACL and had to retire last week as it never healed well enough to be able to play at an NFL level. I think the best chance of a 1st round pick being used on a Running Back is gone as well with Gurley gone for a year likely. Its also disappointing for Georgia’s play-off hopes but hopeful Nick Chubb can help stead the ship and continue to play well. I wish Gurley all the best and hope he recovers. To continue with Georgia a minute, what was that game against Florida? All Georgia had to do was to win out and it would have been in the play-off but no that was too much to ask of the Dawgs despite playing in the pretty torrid SEC East. Instead they went off and lost to a Florida team that completed only 3 passes but ran for 418 yards. How do you give 418 yards rushing to a team that clearly just cannot passes the ball? It simply isn’t good enough and this Bulldogs got found out because of it and now need Mizzou to lose a game before they could get to Atlanta let alone the play-offs. I had the Miss State-Alabama game on in the background as I was watching the Wisconsin-Nebraska but turned over to it as the main game in the fourth after Wisconsin had benched Gordon and it was just a matter of seeing out the game. I have to say I wasn’t that impressed with the Tide but they got the job done and that’s what counts. They came big when it counted with Blake Sims getting some nice conversion with his legs when they need it and their defence being as dominant as ever. Alabama know control their own destiny in the SEC West but the Iron Bowl looms against an Auburn team that would love to play spoiler to the Tide’s play-off dreams. On the whole Baylor/TCU and who should be ranked higher thing I feel the Big 12 should be let play out and one of them will prevail. Right now my leaning is towards TCU because with games against a real OK Oklahoma State team and a pretty good Kansas State team still to come for Baylor as well Bryce Petty not being a revelation or anything I just don’t see them getting to the play-offs. This will sound really hipster and an attempt to seem really avant garde but I did think big things could happen for TCU this year after watching them play last year particularly in the season opener against LSU in Cowboy’s stadium. Things didn’t really work out last season for them and I tempered my expectations after the Devonta Fields was kicked off the team pre-season but man have they been good. Only stopping them this far is the fact that their season was very front loaded and that will affect voters as we get into crunch time. When is a Group of five team going to be ranked? There’s only so long you can put it off for and keeping a Minnesota team in 25th place after it lost its third game of the season over a Marshall team that is the ONLY UNDEFEATED TEAM IN THE ENTIRE COUNTRY is frankly ridiculous in my eyes and I am beginning to suspect are they not going to rank group of five team so they get to an unhindered choice for the access spot. Even if they don’t like Marshall and its strength of schedule then surely Colorado State is worthy of a spot on the list with being ranked in both of the conventional polls and being the best team in the Mountain West. The Committee has got to get some respect for these teams and soon. Notre Dame must be wishing that November never happened with three consecutive losses to go from #5 to unranked. The Florida State and Arizona State losses hurt but are reasonably ok but losing to Northwestern is different matter altogether especially with the way the collapsed in the game. Up by 11 after a Touchdown Brian Kelly decided to go for two rather the extra point and they blew it. With an 11 point lead all Northwestern needed was a TD with a 2 point conversion sand a FG rather than the two TDs they’d have needed if it they’d kicked the extra point. In true Notre Dame fashion this season the winning score came off a turnover. I’ll be back at the end of the month with the second half of the review of November when we’ll have a better view of how things are shaping up. The Browns won last Thursday against the Cincinnati Bengals and coupled with the Steelers loss against the lowly Jets meant that for the first time in 19 years the Browns are in sole possession of 1st place in the AFC North. NINETEEN YEARS!!! Last time the Browns were head of the division Coolio’s Gangsta’s Paradise was top of the charts, Browns GM Ray Farmer was playing safety for Duke and I wouldn’t be born for another two years. Ironically it is almost 19 years to the day since Art Modell decided to betray Cleveland and for the first time since the Browns truly are back. We have had some teams that have gotten hot and over performed before flaming out(2007) and other teams that gave false hope (2002) but this one is different. With two 1st round picks in next year’s draft and with All-Pro receiver Josh Gordon still to come back I don’t see why this cant last. I remember being skeptical back in August when Ray Farmer referenced the Seahawks winning the Super Bowl with no Pro bowl receivers as to why he didn’t pick a receiver in the draft and down right laughing at Mike Pettine’s mantra to “Play like a Brown” but it turns out his idea of it was quite different to mine. While I thought of a team that won only one of their last nine games and just collapsed horrifically under Brandon Weeden and Norv Turner/Ray Horton’s defence not playing on 3rd down, he thought of the Browns teams of the Jim Brown era, who’d punch it up middle and control the game with their dominance in the trenches. It ain’t too pretty and looks like something from the 1970’s but with 6 wins in 9 games when I only predicted them to win 6 games all season. Last year the Browns led the league in pass attempts due to the combination of nobody at Running Back(Fozzy Whitaker? Willis McGahee?) and Norv Turner calling his pass heavy Air Raid offense. This year could well end up being last due to the a completely new rushing attack and a new philosophy under Kyle Shanahan. I must say when I heard Kyle Shanahan was the new OC of the Browns I wasn’t too pleased as I thought it was too pleased as I thought it was to help Johnny Manziel adjust into the starting line up after his success with Robert Griffin III in his Rookie season. Instead he has returned more to his Texan’s playbook that he used to lead them to a top 10 offense with Matt Schaub, Arian Foster and Andre Johnson. Another big reason for the Browns improvement has been the Free Agents signings with leaders like Donte Whitner, Karlos Dansby, Andrew Hawkins and Ben Tate coming from winning orgainisations and hepling to change the culture of the Browns as well as making big plays on the field as well. With a manageable series of games down the stretch with only three games against teams with winning records and All-Pro receiver Josh Gordon due back to practiced in Berea on Monday there is plenty of buzz around the city and the NFL in general about a potential playoff push after a dominating the Bengals on Thursday Night Football(TNF). A win that was all but wrapped up by the second quarter when Billy Cundiff hit a 32 yard field goal, the Bengals had no answers for a Browns offense whose game-plan was to run it down your throat until you forced them to change which they didn’t although it must noted that despite the rest of the teams never leaving the locker room DT Geno Atkins did make some big plays including one where tackled Brian Hoyer to the ground before he could hand it off on a run up the middle. 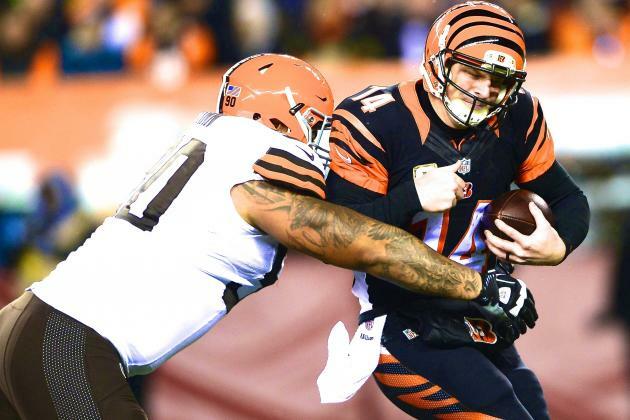 For Cincinnati the “Red Rifle” that is Andy Dalton was horrific and I tried not to be overcritical as a Browns fan as after watching Brandon Weeden I’m grading form a pretty low base but even then his numbers were horrific and for a “Franchise Quarterback” or at least someone who is being like it this just isn’t an acceptable performance. 2.0 that’s his QB rating. Pause for a minute and let that sink in. He threw 3 INTs and was lucky not to have a fourth one after Tashaun Gipson dropped one that was straight to his chest and only had a completion rate of 30%. on the outside All-Pro Joe Haden did a great job covering AJ Green and forcing the action to the other side of the field and allowed Buster Skrine to pick of Dalton twice. Although the Browns won big it really a game about more than football. 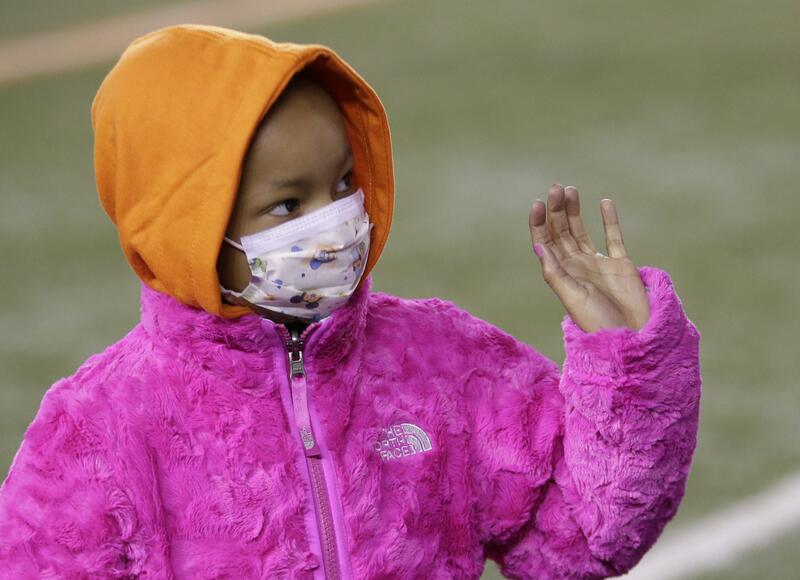 The main event in Paul Brown stadium was the daughter of Devon Stills who stole the show and hearts of crowds during pregame. Leah, the four year old daughter of Stills who is battling cancer was able to see her father play for the first time and in the break between the first and second quarter she was on the pitch with her grandmother to present a cheque of more than $1.3 million for Cincinnati Children’s Hospital for research into pediatric cancer. This money was raised by the sale of her father number 75 jerseys(11th best selling this season) from which all proceeds went to charity. With three straights games against teams who aren’t above .500 there still plenty optimism about the Browns this year. Arguably the most important of those games is the match in Orchard Park against Buffalo as they are not only AFC rivals for a playoff spot but also a win over the Bills would worth twice as much as usual with another victory in the win total and would also make Buffalo’s 1st round pick(which belongs to the Browns from Sammy Watkins trade) more valuable. With want to jinx anything I still don’t see why the Browns cant win at least 4 more games and finish 10-6 and go to the playoffs.